The Fair Grounds Race Course — as well as the New Orleans Jazz and Heritage Festival held there — have made Fairgrounds famous to those outside the Big Easy. For residents, there are many more reasons to love this NOLA neighborhood. From its laid-back residential streets to its boutique shops and local eateries, Fairgrounds has much to offer. A subdistrict of the Mid-City District Area, Fairgrounds sits directly east of City Park (go see those oak trees!). 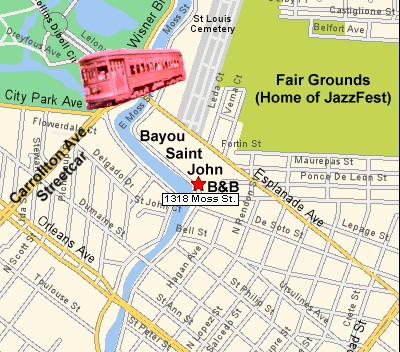 According to the City Planning Commission, Fairgrounds is bordered by Bayou St. John (the waterway) to the west, N Broad Street to the east, Esplanade Avenue to the south, and Florida Avenue to the north. So you can gain a better understanding of life in Fairgrounds, let’s take a look at the past, present, and future of the neighborhood. Native Americans first arrived to what makes up present-day Fairgrounds via the Mississippi River and Bayou St. John. It’s said that the Houma people camped along the Bayou and settled here. Europeans settled parts of Fairgrounds during the 1700s and early 1800s, and soon brought enslaved Africans. Over time, plantations were built sparingly across the swampy land, with rice and sugar as the favored crops. An exciting bit of history during the early 1800s is that a Haitian named “Dr. John”, the Father of New Orleans Voodoo, is believed to have lived and performed rituals in the area, along with his followers. This directly connects the Fairgrounds neighborhood to the development of Louisiana Voodoo. Residential homes began being built in the 1830s, but a lot of housing development in Fairgrounds occurred between 1880 and 1930, with continued building up till today. This is why you’ll encounter all types of architectural styles here, from Acadian cottages to Mediterranean Revival villas to Flatiron-style buildings. An economically and racially diverse neighborhood, Fairgrounds’ continued development, relative affordability, and central location have created a bustling community today. Landmarks like Fair Grounds and Saint Louis Cemetery No. 3 certainly bolster its name recognition, but Fairgrounds truly delights with its old-fashioned New Orleans charm and close-knit atmosphere. It’s the kind of place where neighbors know each other by name. Within the neighborhood, pedestrian- and bike-friendly streets make exploring and enjoying the neighborhood a breeze. Additionally, major attractions in the Big Easy, like the French Quarter and New Orleans Museum of Art, are right beyond Fairgrounds’ borders. Fair Grounds Race Course: Horse races go on throughout the year. Saint Louis Cemetery No. 3: Well-known for its above-ground tombs, this is where you can see the final resting place of many prominent New Orleanians. Liuzza’s by the Track: A casual Creole tavern famous for its signature shrimp BBQ po’ boys. Lola’s: Enjoy authentic Spanish food that’s been infused with flavors from local Creole cuisine. Cafe Degas: A quaint spot for tasty French fare. Indeed, Fairgrounds is a unique and amazing place to be. Look for the neighborhood to continue its growth in popularity in the coming years — as it has all the ingredients you could need.